Bullish Bat harmonic chart pattern is drown applying the Fibonacci ratios. It is an Awesome pattern that signals a buy order. The pattern is an XABCD pattern. In this article I will explain "How to draw a bullish bat harmonic chart pattern" and "How to apply bullish bat harmonic chart pattern to find a buy or sell signal." First let me explain the the way to draw a bullish bat harmonic chart pattern. First of all we must find the point X and point A at the bottom and top of a bullish trend respectively. 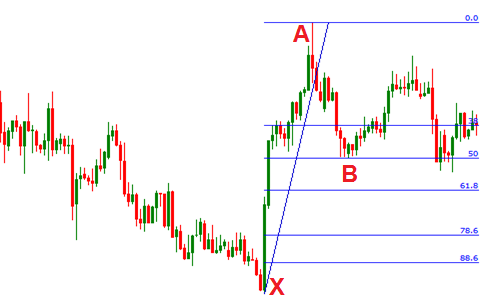 In the second step, we draw a Fibonacci retracement from X to A. The point B is confirmed, if the retracement at point B is 38.2%-50%. In other words the ratio between XA and AB is 0.382-0.50 confirms the B point of bullish bat harmonic pattern. 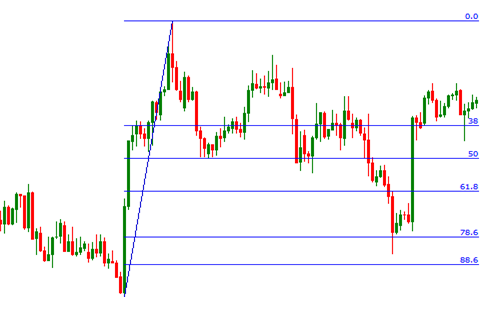 In the third step, a Fibonacci retracement from A to B is drawn. The point C is confirmed, if the retracement at point C is 38.2%-86.6%. In other words the ratio between AB and BC is 0.382-0.886 confirms the C point of bullish bat harmonic pattern. 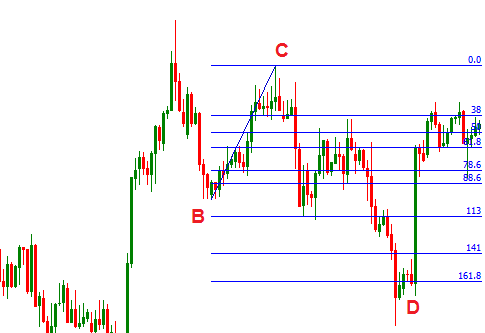 In the fourth step, a Fibonacci retracement from B to C is drawn. The point D is confirmed, if the retracement at point D is 161.8%-261.8%. In other words the ratio between BC and CD is 1.618-2.618 confirms the D point of bullish bat harmonic pattern. In the fifth step the point D is reconfirmed buy calculating the ratio between XA and CD. 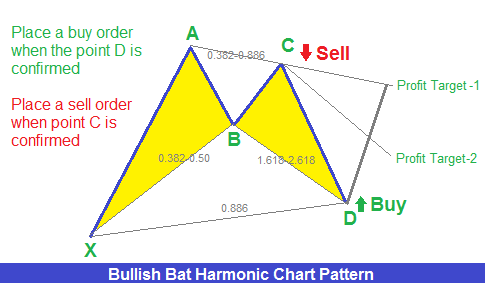 If the ratio is 0.886, the point D of the bullish bat harmonic chart pattern is confirmed. Here we can see the ratio between XA and CD is 0.886. In the final step, we draw the XA, XB, AB, BC, BD, CD straight lines to find the bullish bat harmonic chart pattern. 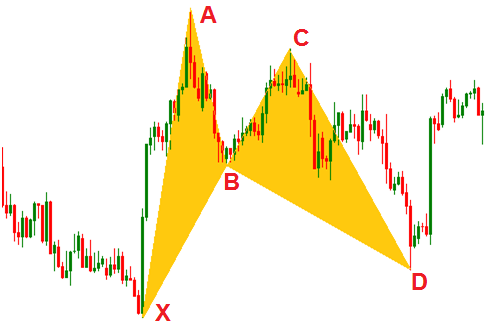 Now I am going to explain the way to trade a bullish bat harmonic chart pattern. A buy order can be placed when the point D is confirmed. The profit target for this order should be placed on AC trend line or at 50%-61.8% retracement of CD. The stop loss for the order can be kept tight. A sell order can also be placed when the point C is confirmed. The stop loss for the order can be placed at the price level of point A. The take profit for this order can be placed at point D.
Dear traders, hope you will be able to apply this harmonic pattern in forex trading and win some pips. If you have any questions, you can drop a comment below. when u write 32.8-88.6. do u mean retracement should be between those two? 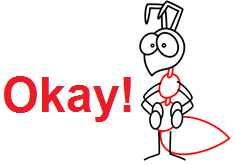 Hi,Clifford Motene, yes the retracement should be between those two fibonacci retracement levels. Actually where to place sl ? My friend,you can select the stop loss at larger fibonacci retracement level of XA or BC. I mean larger than the fibonacci retracement levels that confirm the completion of the pattern. what the difference between bullish bat and bullish gartley both are almost same except the point b retrace is there any diffrence between these two ? My friend,there are so many differences between two patterns. 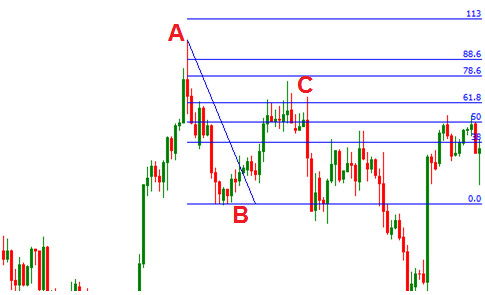 Compare both patterns you will find them out.Only the retracement level at point C of AB is similar in both patterns.